Always aesthetically pleasing, this Belicoso displays all the characteristics of the Romeo y Julieta brand. 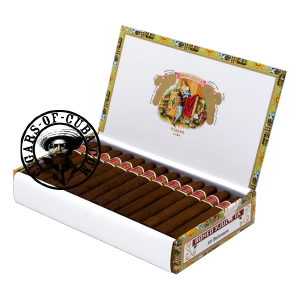 Medium in strength, and abundant in taste, this cigar is a brilliant smoke. The flavors start off warm in a very manageable way, before some power develops in the second phase of the cigar. This is a manageable cigar and can be enjoyed by all smokers. This cigar will get better with age, but smoke well young. Definitely a substitute for the Montecristo 2 Torpedo. A rich Belicoso with generous aromas of leather, wood and cocoa. A classic from Romeo y Julieta.